WebJack was built by @rmeister with input from @jywarren as part of Public Lab’s 2016 Google Summer of Code program. Ask questions and find more tutorials at https://publiclab.org/webjack. Also see webjack-firmata, which builds on webjack to provide a browser-based hardware interface for firmata.js. 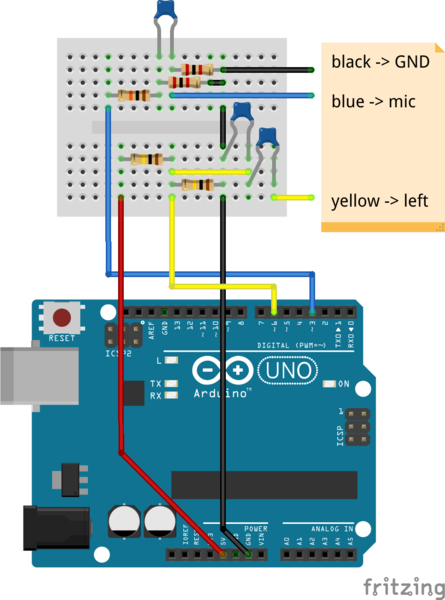 Choose an example sketch and upload it to your Arduino. An Arduino Uno or any other ATmega328p based board is required. Future support for other controllers is discussed here. In addition, it is strongly recommended to build the circuit (or buy the shield) found at SoftModem. The Arduino can be connected to a laptop or smartphone with the correct cable, but different laptops and smartphones require different cables. See Hardware, below. WebJack uses the adapter.js shim for browser interoperability. You have to make sure adapter.js is loaded before webjack.js. Have a look at the demo site in the examples folder. jQuery is only used for the demo site and not required for WebJack. Depending on the profile, WebJack uses different frequencies for the FSK modulation. Note: It is recommended to make the cable length as short as possible, before using the non-default profile. The Browser profile is a planned feature and not working yet. Its purpose is communication between browser tabs on the same or a different device. You can change profile attributes individually. The baud-/bitrate. Has to be a factor 44,1kHz and below 1225 bit/s. The frequency of the lower tone, marks a 0 and has to be a multiple of the baudrate. The frequency of the upper tone, marks a 1 and has to be a multiple of the baudrate. Turn on or off echoCancellation. This enables or disables filtering (high-/lowpass) as well. Set to false for transmissions between browser tabs to improve transmission reliability. If you are receiving sensor data, you can plot a graph of incoming values in the plotter example. 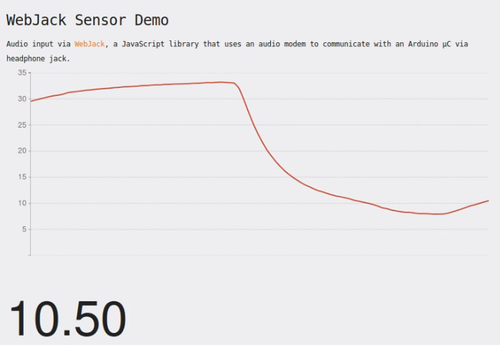 Test it out even without a sensor, by playing audio from this YouTube video of WebJack-transmitted sensor data out loud into the microphone while viewing the above demo. Most smartphones have a 4-pin combined microphone/stereo headphone port which takes a 3.5mm plug, but there are unfortunately different standards for which plug positions (from tip to sleeve) correspond to which wires, and there’s no guarantee that the wires are colored helpfully. The best way to test a cable you’re using is to use a multimeter, or to light up an LED using different pin/wire combinations to see what wire corresponds to what pin. 3.5mm to RCA AV cables (to red/white/yellow “TV-style” plugs) vary: see this listing for various pinouts, and note that the wires inside your cable may be labelled with the convention of red:right, white:left, and yellow:video. The ground wires may be wrapped around each of those three wires, which provides shielding from interference. A recording of the received signal. Please use this AudioRecorder. webjack.js is built using a Grunt task from the source files in /src/, and the compiled file is saved to /dist/webjack.js. To build, run grunt build. To watch files for changes, and build whenever they occur, run grunt. Help improve Public Lab software!